A ritual bath was found in the area in 1994; a Hasmonean coin in 2007. 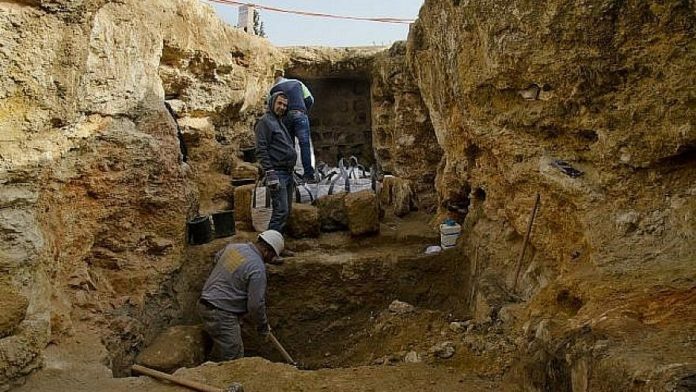 (March 27, 2019 / JNS) A large Hasmonean-era Jewish agricultural village was uncovered by archaeologists in the Arab neighborhood of Sharafat, with a major, multi-generational burial chamber, olive press, ritual baths, a water cistern, dovecote, rock quarries and jar fragments dating back to the time of the Maccabees, providing concrete evidence of the Jewish history of Jerusalem as far back as 2,150 years ago. Jerusalem is believed to have grown from 5,000 residents centered around the City of David to 25,000 residents under the Hasmoneans, necessitating increased agriculture around the city.